Audubon State Park has a packed weekend full of activities to celebrate the Labor Day holiday. Here’s your last opportunity in 2010 to take advantage of the weekly campground activities. Enjoy the cooler temperatures by getting out on the trails! 6:00 PM Fishing Fun (for the last time this year) – Join us for a fun evening of fishing on the lake. We provide the equipment. All you need to bring is a smile and a little bit of luck. Where? Meet at Boat Dock. Who? All, children under the age of 12 must be accompanied by an adult. 16 and older must have a valid Kentucky fishing license. 3:00 PM Wind Spinners – Eye-catching, colorful wind spinners will brighten up any outdoor area. Watch yours spin even in the gentlest breezes. Where? Campground Shelter. How Long? 45 minutes. 6:00 PM BINGO – Bring out the whole family and enjoy an hour of bingo! We will play a variety of Bingo games including traditional, coverall, and more. Come test your luck and possibly win a prize. 7:30 AM Early Bird Walk – John James Audubon enjoyed walking in the forests of Wolf Hills which is now the Audubon Park Nature Preserve. Lifelong birder, Carol Gehret, will lead us along the borders of the woods where viewing is best. We will be in search of sights and sounds of the variety of birds that love the early morning hours. Bring binoculars and a field guide if you have them. Where? Entrance to Warbler Road next to the Main Office. Who? All ages, but children under 10 need adult supervision. 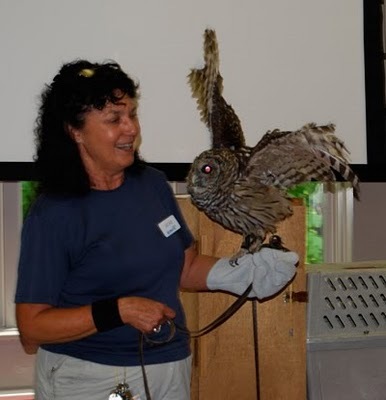 9:00 AM Bird Banding with Scott Kramer – Scott is an Indiana Master Naturalist, Certified Interpretive Guide and federally licensed bird bander. Join Scott while he continues his ongoing conservation project of catching, identifying, banding and releasing birds at the Audubon State Park Nature Preserve. Be prepared to ‘help him out’ when he releases the birds. Be sure to bring your camera for some close-encounter pictures. Where? In back of the Museum at the patio. How Long? 1 hour Who? Everyone! 11:00 AM Campground Scavenger Hunt – Decorate a Scavenger Hunt Bag and set out on an excursion through the Campground. The people who find everything on the list will win a neat prize. 2:00 PM Habitats-R-Us – The Earth has many different environments, and each of these habitats has distinct life forms living in it. Learn what it takes for them to survive. Then we will design and create our own biome. Who? Age 6 and older. 4:00 PM Ice Cream In a Bag – I scream! You scream! We all scream for Ice Cream! You can make your favorite flavor in a most unusual way and get to enjoy it right away. Where? Campground Shelter. 12:00 PM “Fly Like An Eagle” Raptor Show – Experience how magnificent our National Symbol truly is. Discover the strength of their talons, how big they build nests, the unique sounds they make, and win a chance to dress like an eagle. Also meet, up close and personal, a cousin of the eagle. Who? All ages Children under 7 should be supervised by an adult. 2:15 PM Labor Day Parade Preparation – Meet at the Campground Shelter to decorate your bicycles, scooters, wagons and floats for our parade. We’ll have lots of red, white and blue streamers, balloons and crepe paper. Cool lemonade will be served to quench your thirst. 3:00 PM Labor Day Campground Parade – Everyone loves a parade, and you will too when you join us for a parade around Audubon’s Campground. Bring your bicycles, tricycles, scooters, motorcycles, wagons and baby strollers for a red – white & blue celebration! Where? Campground Shelter. 10:00 AM Backyard Bird Feeder – Three words that can help protect our planet: Reduce. Reuse. Recycle. You can do your part when you make a hummingbird feeder from #1 and #2 plastic bottles. Bring along an empty 20 oz or less bottle, and we will provide the rest of the supplies. Those sounded like fantastic Labor Day weekend camping activities. We usually go camping all the time in the summer, but our site doesn’t have as many fun activities as this one! I’d love to have a parade where we could push our kids in their strollers – they’d love it!